Want a healthy breakfast on your busy mornings? 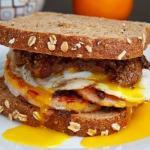 This caramelized onions and egg sandwich is just what you might be looking for. Warm the olive oil in a pan over medium high heat. Add onions and salt. Cook until slightly caramelized. Turn the heat off. Set aside. Toast the bread in a toaster oven until slightly brown and crispy. Spread the caramelized onions mix over the toasted bread. Sprinkle black pepper evenly. Place egg slices on top of caramelized onion mix. Place the second toasted bread on top. If you prefer, cut it in half or triangles.